It’s been a while since I’ve made these…and then I realized, even though you may have seen them before, I’ve never blogged about them. Plus, I’ve made a couple changes to the originals. It all started when I found (orange!) candy-coated sunflower seeds at Tj-Maxx/HomeGoods. 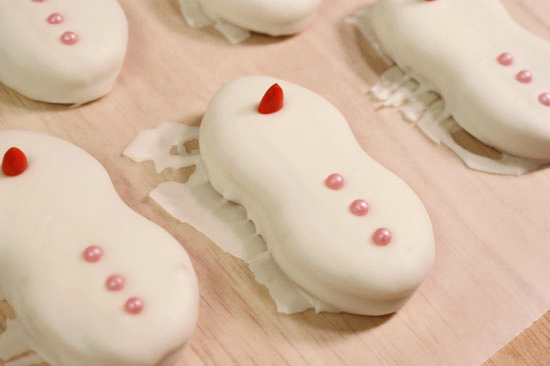 Immediately I thought – noses, as carrots for snowmen! Just what any normal person would think if they came across these, right!? Well anyways, I highly suggest you go buy yourself a pack o’ Nutter Butters, some Candiquik and fancy sprinkles. Because these guys are too cute. Begin by melting Vanilla Candiquik in the tray according to package directions. Dip Nutter Butter cookies in the coating and place on wax paper. Before the coating has set, press 1 coated sunflower seed as the nose and 3 confetti sprinkles as buttons; let set. 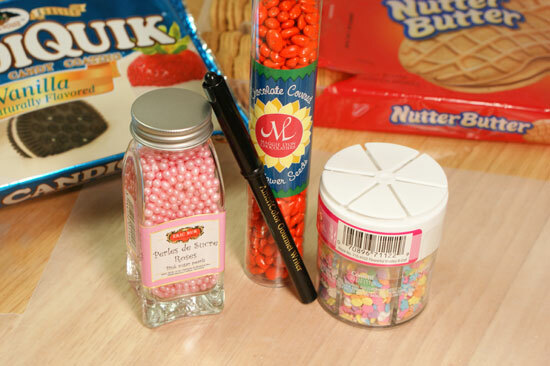 Once the coating is completely dry, use the edible marker to draw eyes and smile (or smirk, grin, “O”, etc.). Using cake writing icing to pipe on hat. Melt Vanilla CANDIQUIK® Coating in Melt and Make Microwaveable Tray™ according to directions on package. 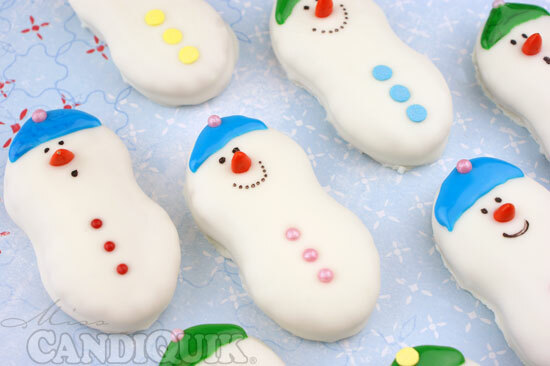 Dip cookies in melted CANDIQUIK® and place on wax paper. Press (3) round confetti sprinkles as buttons and (1) orange coated sunflower seed as the nose. 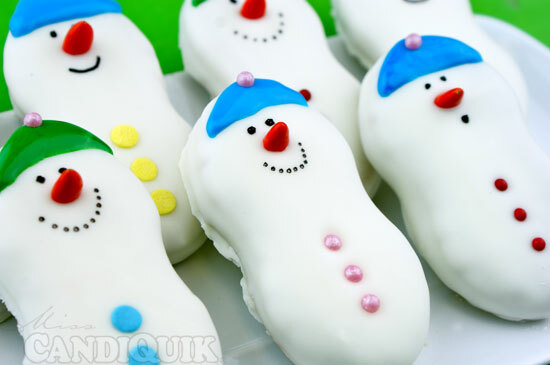 Once dry, create faces with edible marker and hats with decorative icings. 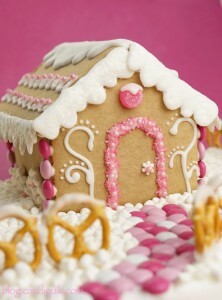 Tips for making the perfect gingerbread house! I have always thought these were so adorable! I am going to make some for sure; yours are darling! What else could be used in place of the sunflower seeds? Just icing? Hi Amanda, try using an orange tic tac!! These are the cutest Nutter Butter’s I have ever seen. Thanks so much for sharing at Whatcha Whipped Up Wednesday. 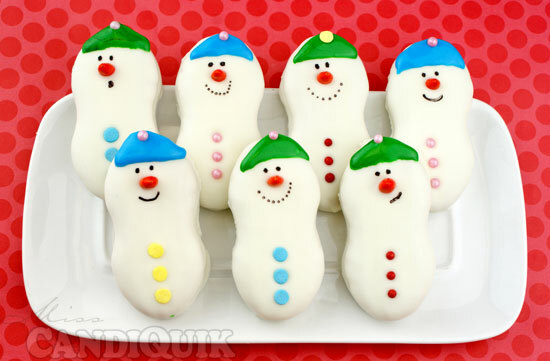 Very cute and they are the perfect snowmen shape!! I can not wait to try these this year! I like to make things in advance and was wondering if I have to worry about the nutter butter getting soggy at all from the candiquik? Thank you! Hi Yevette! You shouldn’t have any troubles with the cookies getting soggy, just store them in an airtight container until ready to serve!